While psychologists have long debated the core personality dimensions that define humanity, primate researchers have been working to uncover the defining personality traits for humankind's closest living relative, the chimpanzee. New research, published in the June 3 issue of American Journal of Primatology provides strong support for the universal existence of five personality dimensions in chimpanzees: reactivity/undependability, dominance, openness, extraversion and agreeableness with a possible sixth factor, methodical, needing further investigation. "Understanding chimpanzee personality has important theoretical and practical implications," explained lead author Hani Freeman, postdoctoral fellow with the Lester E. Fisher Center for the Study and Conservation of Apes at Lincoln Park Zoo. "From an academic standpoint, the findings can inform investigations into the evolution of personality. From a practical standpoint, caretakers of chimpanzees living in zoos or elsewhere can now tailor individualized care based on each animal's personality thereby improving animal welfare." The study of chimpanzee personality is not novel; however, according to the authors, previous instruments designed to measure personality left a number of vital questions unanswered. "Some personality scales used for chimpanzees were originally designed for another species. These 'top-down' approaches are susceptible to including traits that are not relevant for chimps, or fail to include all the relevant aspects of chimpanzee personality," explained Freeman. "Another tactic, called a 'bottom-up' approach, derives traits specifically for chimpanzees without taking into account information from previous scales. This approach also has limitations as it impedes comparisons with findings in other studies and other species, which is essential if you want to use research on chimpanzees to better understand the evolution of human personality traits." To address the limitations of each approach and gain a better understanding of chimpanzee personality, the authors developed a new personality rating scale that incorporated the strengths of both types of scales. This new scale consisted of 41 behavioral descriptors including boldness, jealousy, friendliness and stinginess amongst others. Seventeen raters who work closely and directly with chimpanzees used the scale to assess 99 chimpanzees in their care at the Michale E. Keeling Center for Comparative Medicine and Research, UT MD Anderson Cancer Center in Bastrop, Texas. The chimpanzees rated were aged 8 to 48, a majority had been captive born and mother-raised, and all had lived at the facility for at least two years. To validate their findings, the researchers used two years worth of behavioral data collected on the chimpanzees. 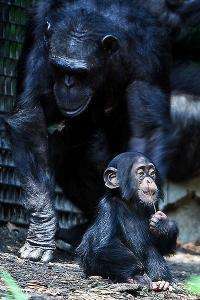 As the authors expected, the findings showed the personality ratings were associated with differences in how the chimpanzees behaved. The researchers also showed the raters tended to agree in their independent judgments of chimpanzees' personalities, suggesting the raters were not merely projecting traits onto the chimpanzees. Researchers suggest that one benefit to having the chimpanzees rated on the five core personality dimensions is that this information can now be used to make predictions that will help in their management, such as how individual chimpanzees will behave in various social situations. This type of information will help zoos better anticipate certain behaviors from various individuals, and will assist them in providing individualized care. Why don't they just ask Jane Goodall questions instead of relying on data from captive born chimps studied only 2 years?